1 A None No Power Seat 1 A is a standard Business Class seat that transforms into a fully-flat although slightly angled bed. The seat is located at a bulkhead. The proximity to the galley and lavatory area might be bothersome. 1 C None No Power Seat 1 C is a standard Business Class seat that transforms into a fully-flat although slightly angled bed. The seat is located at a bulkhead. The proximity to the galley and lavatory area might be bothersome. 1 D None No Power Seat 1 D is a standard Business Class seat that transforms into a fully-flat although slightly angled bed. The seat is located at a bulkhead. A bassinet might be placed on the bulkhead, therefore, a passenger traveling with an infant might sit in this area. The proximity to the galley and lavatory area might be bothersome. 1 G None No Power Seat 1 G is a standard Business Class seat that transforms into a fully-flat although slightly angled bed. The seat is located at a bulkhead. A bassinet might be placed on the bulkhead, therefore, a passenger traveling with an infant might sit in this area. The proximity to the galley and lavatory area might be bothersome. 1 H None No Power Seat 1 H is a standard Business Class seat that transforms into a fully-flat although slightly angled bed. The seat is located at a bulkhead. The proximity to the galley and lavatory area might be bothersome. 1 K None No Power Seat 1 K is a standard Business Class seat that transforms into a fully-flat although slightly angled bed. The seat is located at a bulkhead. The proximity to the galley and lavatory area might be bothersome. 10 A None No Power Seat 10 A is a standard Economy Class seat in the section AirAsia X designates as the "Quiet Zone". 10 B None No Power Seat 10 B is a standard Economy Class seat in the section AirAsia X designates as the "Quiet Zone". 10 C None No Power Seat 10 C is a standard Economy Class seat in the section AirAsia X designates as the "Quiet Zone". 10 D None No Power Seat 10 D is a standard Economy Class seat in the section AirAsia X designates as the "Quiet Zone". 10 F None No Power Seat 10 F is a standard Economy Class seat in the section AirAsia X designates as the "Quiet Zone". 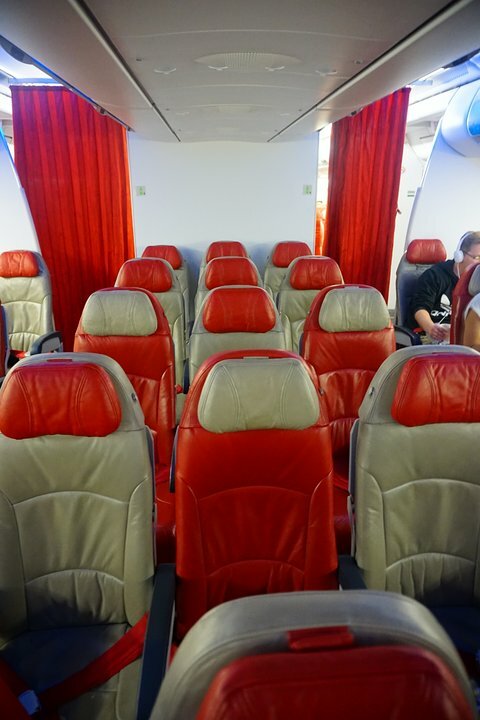 10 G None No Power Seat 10 G is a standard Economy Class seat in the section AirAsia X designates as the "Quiet Zone". 10 H None No Power Seat 10 H is a standard Economy Class seat in the section AirAsia X designates as the "Quiet Zone". 10 J None No Power Seat 10 J is a standard Economy Class seat in the section AirAsia X designates as the "Quiet Zone". 10 K None No Power Seat 10 K is a standard Economy Class seat in the section AirAsia X designates as the "Quiet Zone". 11 A None No Power Seat 11 A is a standard Economy Class seat in the section AirAsia X designates as the "Quiet Zone". 11 B None No Power Seat 11 B is a standard Economy Class seat in the section AirAsia X designates as the "Quiet Zone". 11 C None No Power Seat 11 C is a standard Economy Class seat in the section AirAsia X designates as the "Quiet Zone". 11 D None No Power Seat 11 D is a standard Economy Class seat in the section AirAsia X designates as the "Quiet Zone". 11 F None No Power Seat 11 F is a standard Economy Class seat in the section AirAsia X designates as the "Quiet Zone". 11 G None No Power Seat 11 G is a standard Economy Class seat in the section AirAsia X designates as the "Quiet Zone". 11 H None No Power Seat 11 H is a standard Economy Class seat in the section AirAsia X designates as the "Quiet Zone". 11 J None No Power Seat 11 J is a standard Economy Class seat in the section AirAsia X designates as the "Quiet Zone". 11 K None No Power Seat 11 K is a standard Economy Class seat in the section AirAsia X designates as the "Quiet Zone". 12 A None No Power Seat 12 A is a standard Economy Class seat in the section AirAsia X designates as the "Quiet Zone". 12 B None No Power Seat 12 B is a standard Economy Class seat in the section AirAsia X designates as the "Quiet Zone". 12 C None No Power Seat 12 C is a standard Economy Class seat in the section AirAsia X designates as the "Quiet Zone". 12 D None No Power Seat 12 D is a standard Economy Class seat in the section AirAsia X designates as the "Quiet Zone". 12 F None No Power Seat 12 F is a standard Economy Class seat in the section AirAsia X designates as the "Quiet Zone". 12 G None No Power Seat 12 G is a standard Economy Class seat in the section AirAsia X designates as the "Quiet Zone". 12 H None No Power Seat 12 H is a standard Economy Class seat in the section AirAsia X designates as the "Quiet Zone". 12 J None No Power Seat 12 J is a standard Economy Class seat in the section AirAsia X designates as the "Quiet Zone". 12 K None No Power Seat 12 K is a standard Economy Class seat in the section AirAsia X designates as the "Quiet Zone". 14 A None No Power Seat 14 A is an Economy Class seat, however the proximity to the lavatory and galley may be bothersome. This seat is designated by AirAsia X as being part of the "Quiet Zone". This seat is missing a window. 14 B None No Power Seat 14 B is an Economy Class seat, however the proximity to the lavatory and galley may be bothersome. This seat is designated by AirAsia X as being part of the "Quiet Zone". 14 C None No Power Seat 14 C is an Economy Class seat, however the proximity to the lavatory and galley may be bothersome. 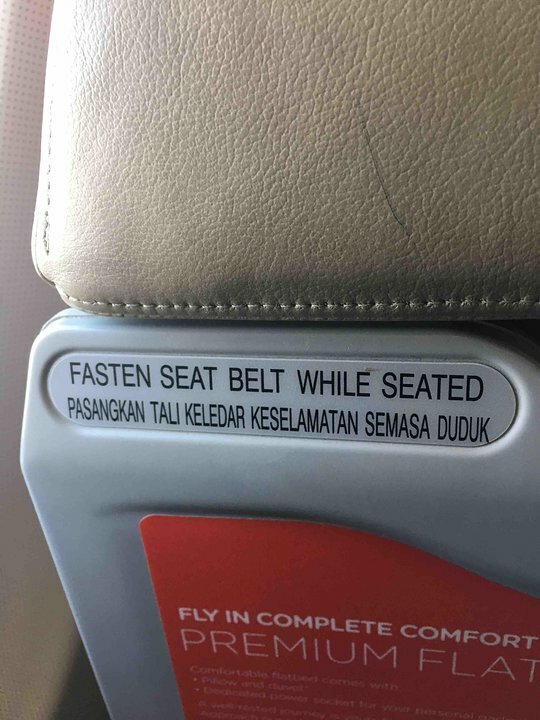 This seat is designated by AirAsia X as being part of the "Quiet Zone". 14 D None No Power Seat 14 D is an Economy Class seat, however the proximity to the lavatory and galley may be bothersome. This seat is designated by AirAsia X as being part of the "Quiet Zone". 14 F None No Power Seat 14 F is an Economy Class seat, however the proximity to the lavatory and galley may be bothersome. This seat is designated by AirAsia X as being part of the "Quiet Zone". 14 G None No Power Seat 14 G is an Economy Class seat, however the proximity to the lavatory and galley may be bothersome. This seat is designated by AirAsia X as being part of the "Quiet Zone". 14 H None No Power Seat 14 H is an Economy Class seat, however the proximity to the lavatory and galley may be bothersome. This seat is designated by AirAsia X as being part of the "Quiet Zone". 14 J None No Power Seat 14 J is an Economy Class seat, however the proximity to the lavatory and galley may be bothersome. This seat is designated by AirAsia X as being part of the "Quiet Zone". 14 K None No Power Seat 14 K is an Economy Class seat, however the proximity to the lavatory and galley may be bothersome. This seat is designated by AirAsia X as being part of the "Quiet Zone". This seat is missing a window. 15 H None No Power Seat 15 H is designated by AirAsia X as a Hot Seat. Hot Seats are specially designated seats but remain a standard Economy class product. This seat may be pre-selected for an extra fee. The proximity to the galley may be bothersome. 15 J None No Power Seat 15 J is designated by AirAsia X as a Hot Seat. Hot Seats are specially designated seats but remain a standard Economy class product. This seat may be pre-selected for an extra fee. The proximity to the galley may be bothersome. 15 K None No Power Seat 15 K is designated by AirAsia X as a Hot Seat. Hot Seats are specially designated seats but remain a standard Economy class product. This seat may be pre-selected for an extra fee. The proximity to the galley may be bothersome. 16 D None No Power Seat 16 D is designated by AirAsia X as a Hot Seat. Hot Seats are specially designated seats but remain a standard Economy class product. This seat may be pre-selected for an extra fee. A bassinet might be placed on the bulkhead, therefore, a passenger traveling with an infant might sit in this area. The proximity to the lavatory and galley may be bothersome. 16 F None No Power Seat 16 F is designated by AirAsia X as a Hot Seat. Hot Seats are specially designated seats but remain a standard Economy class product. This seat may be pre-selected for an extra fee. A bassinet might be placed on the bulkhead, therefore, a passenger traveling with an infant might sit in this area. The proximity to the lavatory and galley may be bothersome. 16 G None No Power Seat 16 G is designated by AirAsia X as a Hot Seat. Hot Seats are specially designated seats but remain a standard Economy class product. This seat may be pre-selected for an extra fee. A bassinet might be placed on the bulkhead, therefore, a passenger traveling with an infant might sit in this area. The proximity to the lavatory and galley may be bothersome. 17 A None No Power Seat 17 A is designated by AirAsia X as a Hot Seat. Hot Seats are specially designated seats but remain a standard Economy class product. This seat may be pre-selected for an extra fee. The proximity to the lavatory and galley may be bothersome. 17 B None No Power Seat 17 B is designated by AirAsia X as a Hot Seat. Hot Seats are specially designated seats but remain a standard Economy class product. This seat may be pre-selected for an extra fee. The proximity to the lavatory and galley may be bothersome. 17 C None No Power Seat 17 C is designated by AirAsia X as a Hot Seat. Hot Seats are specially designated seats but remain a standard Economy class product. This seat may be pre-selected for an extra fee. The proximity to the lavatory and galley may be bothersome. 2 A None No Power Seat 2 A is a standard Business Class seat that transforms into a fully-flat although slightly angled bed. 2 C None No Power Seat 2 C is a standard Business Class seat that transforms into a fully-flat although slightly angled bed. 2 D None No Power Seat 2 D is a standard Business Class seat that transforms into a fully-flat although slightly angled bed. 2 G None No Power Seat 2 G is a standard Business Class seat that transforms into a fully-flat although slightly angled bed. 2 H None No Power Seat 2 H is a standard Business Class seat that transforms into a fully-flat although slightly angled bed. 2 K None No Power Seat 2 K is a standard Business Class seat that transforms into a fully-flat although slightly angled bed. 33 A None No Power Seat 33 A is a standard Economy class seat, however, the proximity to the lavatories may be bothersome. 33 B None No Power Seat 33 B is a standard Economy class seat, however, the proximity to the lavatories may be bothersome. 33 C None No Power Seat 33 C is a standard Economy class seat, however, the proximity to the lavatories may be bothersome. 33 D None No Power Seat 33 D is a standard Economy class seat, however, the proximity to the lavatories may be bothersome. 33 F None No Power Seat 33 F is a standard Economy class seat, however, the proximity to the lavatories may be bothersome. 33 G None No Power Seat 33 G is a standard Economy class seat, however, the proximity to the lavatories may be bothersome. 33 H None No Power Seat 33 H is a standard Economy class seat, however, the proximity to the lavatories may be bothersome. 33 J None No Power Seat 33 J is a standard Economy class seat, however, the proximity to the lavatories may be bothersome. 33 K None No Power Seat 33 K is a standard Economy class seat, however, the proximity to the lavatories may be bothersome. 34 D None No Power Seat 34 D is designated by AirAsia X as a Hot Seat. Hot Seats are specially designated seats but remain a standard Economy class product. This seat may be pre-selected for an extra fee. A bassinet might be placed on the bulkhead, therefore, a passenger traveling with an infant might sit in this area. The proximity to the lavatory may be bothersome. Seat 34 D is designated by AirAsia X as a Hot Seat. Hot Seats are specially designated seats but remain a standard Economy class product. This seat may be pre-selected for an extra fee. A bassinet might be placed on the bulkhead, therefore, a passenger traveling with an infant might sit in this area. The proximity to the lavatory may be bothersome. Seat 34 D is designated by AirAsia X as a Hot Seat. Hot Seats are specially designated seats but remain a standard Economy class product. This seat may be pre-selected for an extra fee. A bassinet might be placed on the bulkhead, therefore, a passenger traveling with an infant might sit in this area. The proximity to the lavatory may be bothersome. 34 F None No Power Seat 34 F is designated by AirAsia X as a Hot Seat. Hot Seats are specially designated seats but remain a standard Economy class product. This seat may be pre-selected for an extra fee. A bassinet might be placed on the bulkhead, therefore, a passenger traveling with an infant might sit in this area. The proximity to the lavatory may be bothersome. Seat 34 F is designated by AirAsia X as a Hot Seat. Hot Seats are specially designated seats but remain a standard Economy class product. This seat may be pre-selected for an extra fee. A bassinet might be placed on the bulkhead, therefore, a passenger traveling with an infant might sit in this area. The proximity to the lavatory may be bothersome. Seat 34 F is designated by AirAsia X as a Hot Seat. Hot Seats are specially designated seats but remain a standard Economy class product. This seat may be pre-selected for an extra fee. A bassinet might be placed on the bulkhead, therefore, a passenger traveling with an infant might sit in this area. The proximity to the lavatory may be bothersome. 34 G None No Power Seat 34 G is designated by AirAsia X as a Hot Seat. Hot Seats are specially designated seats but remain a standard Economy class product. This seat may be pre-selected for an extra fee. A bassinet might be placed on the bulkhead, therefore, a passenger traveling with an infant might sit in this area. The proximity to the lavatory may be bothersome. Seat 34 G is designated by AirAsia X as a Hot Seat. Hot Seats are specially designated seats but remain a standard Economy class product. This seat may be pre-selected for an extra fee. A bassinet might be placed on the bulkhead, therefore, a passenger traveling with an infant might sit in this area. The proximity to the lavatory may be bothersome. Seat 34 G is designated by AirAsia X as a Hot Seat. Hot Seats are specially designated seats but remain a standard Economy class product. This seat may be pre-selected for an extra fee. A bassinet might be placed on the bulkhead, therefore, a passenger traveling with an infant might sit in this area. The proximity to the lavatory may be bothersome. 35 A None No Power Seat 35 A is designated by AirAsia X as a Hot Seat. Hot Seats are specially designated seats but remain a standard Economy class product. This seat may be pre-selected for an extra fee. The proximity to the lavatories may bothersome. 35 B None No Power Seat 35 B is designated by AirAsia X as a Hot Seat. Hot Seats are specially designated seats but remain a standard Economy class product. This seat may be pre-selected for an extra fee. The proximity to the lavatories may bothersome. 35 C None No Power Seat 35 C is designated by AirAsia X as a Hot Seat. Hot Seats are specially designated seats but remain a standard Economy class product. This seat may be pre-selected for an extra fee. The proximity to the lavatories may bothersome. 35 H None No Power Seat 35 H is designated by AirAsia X as a Hot Seat. Hot Seats are specially designated seats but remain a standard Economy class product. This seat may be pre-selected for an extra fee. The proximity to the lavatories may bothersome. 35 J None No Power Seat 35 J is designated by AirAsia X as a Hot Seat. Hot Seats are specially designated seats but remain a standard Economy class product. This seat may be pre-selected for an extra fee. The proximity to the lavatories may bothersome. 35 K None No Power Seat 35 K is designated by AirAsia X as a Hot Seat. Hot Seats are specially designated seats but remain a standard Economy class product. This seat may be pre-selected for an extra fee. The proximity to the lavatories may bothersome. 43 D None No Power Seat 43 D is a standard Economy class seat, however, other flyers tend to bump into this seat. 43 G None No Power Seat 43 G is a standard Economy class seat, however, other flyers tend to bump into this seat. 50 C None No Power Seat 50 C is a standard Economy class seat, however, the proximity to the lavatories and galley may be bothersome. 50 D None No Power Seat 50 D is a standard Economy class seat, however, the proximity to the lavatories and galley may be bothersome. 50 G None No Power Seat 50 G is a standard Economy class seat, however, the proximity to the lavatories and galley may be bothersome. 50 H None No Power Seat 50 H is a standard Economy class seat, however, the proximity to the lavatories and galley may be bothersome. 51 A None No Power Seat 51 A is a standard Economy class seat, however, the proximity to the lavatories and galley may be bothersome. This seat may have limited recline. 51 C None No Power Seat 51 C is a standard Economy class seat, however, the proximity to the lavatories and galley may be bothersome. This seat may have limited recline. 51 D None No Power Seat 51 D is a standard Economy class seat, however, the proximity to the lavatories and galley may be bothersome. This seat may have limited recline. 51 F None No Power Seat 51 F is a standard Economy class seat, however, the proximity to the lavatories and galley may be bothersome. This seat may have limited recline. 51 G None No Power Seat 51 G is a standard Economy class seat, however, the proximity to the lavatories and galley may be bothersome. This seat may have limited recline. 51 H None No Power Seat 51 H is a standard Economy class seat, however, the proximity to the lavatories and galley may be bothersome. This seat may have limited recline. 51 K None No Power Seat 51 K is a standard Economy class seat, however, the proximity to the lavatories and galley may be bothersome. This seat may have limited recline. 7 A None No Power Seat 7 A is an Economy Class seat that has extra legroom. This seat has immovable armrests, which slightly decreases seat width and can be uncomfortable while sleeping on overnight flights. It is designated by AirAsia X as a Hot Seat. Hot Seats are specially designated seats but remain a standard Economy class product. This seat may be pre-selected for an extra fee. This seat is also located in the section AirAsia X has designated as the "Quiet Zone". 7 B None No Power Seat 7 B is an Economy Class seat that has extra legroom. This seat has immovable armrests, which slightly decreases seat width and can be uncomfortable while sleeping on overnight flights. It is designated by AirAsia X as a Hot Seat. Hot Seats are specially designated seats but remain a standard Economy class product. This seat may be pre-selected for an extra fee. This seat is also located in the section AirAsia X has designated as the "Quiet Zone". 7 C None No Power Seat 7 C is an Economy Class seat that has extra legroom. This seat has immovable armrests, which slightly decreases seat width and can be uncomfortable while sleeping on overnight flights. It is designated by AirAsia X as a Hot Seat. Hot Seats are specially designated seats but remain a standard Economy class product. This seat may be pre-selected for an extra fee. This seat is also located in the section AirAsia X has designated as the "Quiet Zone". 7 D None No Power Seat 7 D is an Economy Class seat that has extra legroom. This seat has immovable armrests, which slightly decreases seat width and can be uncomfortable while sleeping on overnight flights. It is designated by AirAsia X as a Hot Seat. Hot Seats are specially designated seats but remain a standard Economy class product. This seat may be pre-selected for an extra fee. This seat is also located in the section AirAsia X has designated as the "Quiet Zone". 7 F None No Power Seat 7 F is an Economy Class seat that has extra legroom. This seat has immovable armrests, which slightly decreases seat width and can be uncomfortable while sleeping on overnight flights. It is designated by AirAsia X as a Hot Seat. Hot Seats are specially designated seats but remain a standard Economy class product. This seat may be pre-selected for an extra fee. This seat is also located in the section AirAsia X has designated as the "Quiet Zone". 7 G None No Power Seat 7 G is an Economy Class seat that has extra legroom. This seat has immovable armrests, which slightly decreases seat width and can be uncomfortable while sleeping on overnight flights. It is designated by AirAsia X as a Hot Seat. Hot Seats are specially designated seats but remain a standard Economy class product. This seat may be pre-selected for an extra fee. This seat is also located in the section AirAsia X has designated as the "Quiet Zone". 7 H None No Power Seat 7 H is an Economy Class seat that has extra legroom. This seat has immovable armrests, which slightly decreases seat width and can be uncomfortable while sleeping on overnight flights. It is designated by AirAsia X as a Hot Seat. Hot Seats are specially designated seats but remain a standard Economy class product. This seat may be pre-selected for an extra fee. This seat is also located in the section AirAsia X has designated as the "Quiet Zone". 7 J None No Power Seat 7 J is an Economy Class seat that has extra legroom. This seat has immovable armrests, which slightly decreases seat width and can be uncomfortable while sleeping on overnight flights. It is designated by AirAsia X as a Hot Seat. Hot Seats are specially designated seats but remain a standard Economy class product. This seat may be pre-selected for an extra fee. This seat is also located in the section AirAsia X has designated as the "Quiet Zone". 7 K None No Power Seat 7 K is an Economy Class seat that has extra legroom. This seat has immovable armrests, which slightly decreases seat width and can be uncomfortable while sleeping on overnight flights. It is designated by AirAsia X as a Hot Seat. Hot Seats are specially designated seats but remain a standard Economy class product. This seat may be pre-selected for an extra fee. This seat is also located in the section AirAsia X has designated as the "Quiet Zone". 8 A None No Power Seat 8 A is a standard Economy Class seat in the section AirAsia X designates as the "Quiet Zone". 8 B None No Power Seat 8 B is a standard Economy Class seat in the section AirAsia X designates as the "Quiet Zone". 8 C None No Power Seat 8 C is a standard Economy Class seat in the section AirAsia X designates as the "Quiet Zone". 8 D None No Power Seat 8 D is a standard Economy Class seat in the section AirAsia X designates as the "Quiet Zone". 8 F None No Power Seat 8 F is a standard Economy Class seat in the section AirAsia X designates as the "Quiet Zone". 8 G None No Power Seat 8 G is a standard Economy Class seat in the section AirAsia X designates as the "Quiet Zone". 8 H None No Power Seat 8 H is a standard Economy Class seat in the section AirAsia X designates as the "Quiet Zone". 8 J None No Power Seat 8 J is a standard Economy Class seat in the section AirAsia X designates as the "Quiet Zone". 8 K None No Power Seat 8 K is a standard Economy Class seat in the section AirAsia X designates as the "Quiet Zone". 9 A None No Power Seat 9 A is a standard Economy Class seat in the section AirAsia X designates as the "Quiet Zone". 9 B None No Power Seat 9 B is a standard Economy Class seat in the section AirAsia X designates as the "Quiet Zone". 9 C None No Power Seat 9 C is a standard Economy Class seat in the section AirAsia X designates as the "Quiet Zone". 9 D None No Power Seat 9 D is a standard Economy Class seat in the section AirAsia X designates as the "Quiet Zone". 9 F None No Power Seat 9 F is a standard Economy Class seat in the section AirAsia X designates as the "Quiet Zone". 9 G None No Power Seat 9 G is a standard Economy Class seat in the section AirAsia X designates as the "Quiet Zone". 9 H None No Power Seat 9 H is a standard Economy Class seat in the section AirAsia X designates as the "Quiet Zone". 9 J None No Power Seat 9 J is a standard Economy Class seat in the section AirAsia X designates as the "Quiet Zone". 9 K None No Power Seat 9 K is a standard Economy Class seat in the section AirAsia X designates as the "Quiet Zone". AC power oulets are offered in the Business Class cabin only. AirAsia X provides Wi-Fi access through ROKKI!i. Various plans may be purchsed prior to departure. Additional infomation may be access by clicking here. In Business Class drinks and meal service are complimentary. 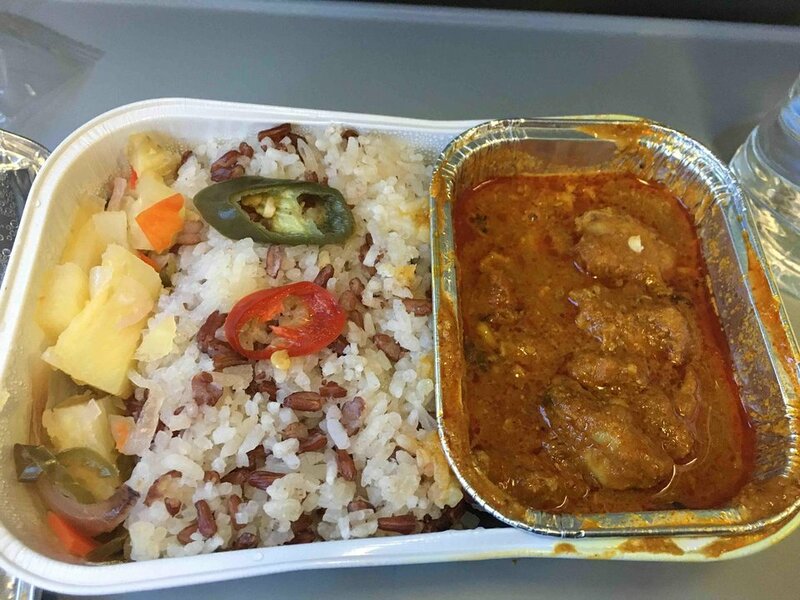 In Economy Class food service orders may be purchased online before the flight. Menus vary and depend on route. For More Information Click Here. The Airbus A330-300 is the workhorse of the AirAsia X long-haul fleet. The aircraft is configured with 12 full lie-flat bed premium class seats in Business Class. These new premium flat beds feature a universal power socket, personalized reading light, foldaway table, and adjustable head and foot rests. Economy class features 365 standard seats with a 3-3-3 configuration. The fuselage narrows at row 44 where the configuration is less dense with a 2-3-2 layout. AirAsia X has implemented an exclusive reserved area entitled Quiet Zone. This area extends from rows 7-14 and is open to all passengers who are looking for a quieter more pleasant flying experience. These seats come at an extra cost and are located behind the Premium seats. Passengers travelling with infants and children under the age of 12 will not be permitted to seat in this area. On most long-haul flights, a Samsung Galaxy Xcite Tab tablet may be rented. AirAsia X tablets offer a selection of films, games, magazines, music, and television shows. See AirAsia.com for more information about video entertainment onboard. Every seat in economy class on this aircraft should be yellow due to the narrow seat width caused by nine abreast seating. A standard A330 has eight abreast in economy. Extremely uncomfortable. Small legroom, OK for short-haul flight but not suitable for long-haul flight. I flew on this flight from KUL-OOL then on board OOL-AKL with my husband and 18 months old son. We took the same flight to return to KUL. My first impression upon entering was "Oh my God, it was so cramped". I am a bit heavy and luckily our seat was on 17A/C i.e. the first one upon entering the plane. So I don't need to squeeze myself through the seats. I have travelled on many airlines before, so I don't remember the seats and the space are this small. Luckily we spent extra for the hot seats (17A and C)which have extra leg room, and plenty of space for my son to play around. We were lucky to have an inflatable leg support so that I can extend my legs throughout the flight and let my son sleep on them. To be honest, for long haul flights, please search other airline than this. The price plus hot seats and meals are equivalent to MAS on promotion (plus they have no layover). There were some Europeans who immediately requested an upgrade upon entering the economy cabin. Great service and extremely friendly staff. Seat fine for 8 hours and was very comfortable. THANK YOU AIR ASIA X!! Nice seating on the aisle. Always pick the middle row aisle seat so that a fair chance that the middle seat is empty and you dont have to jostle for elbow space. Not applicable for full flight during Malaysian or Aussie school holidays period. Forget IFE and full service, this is a low cost carrier. Good thing they limited the cabin baggage to 7 kg otherwise youll see cheapskates with 20 kgs of hand luggage on board. This seat is good, aside from the loud annoying banging sound from the galley during takeoff and landing. 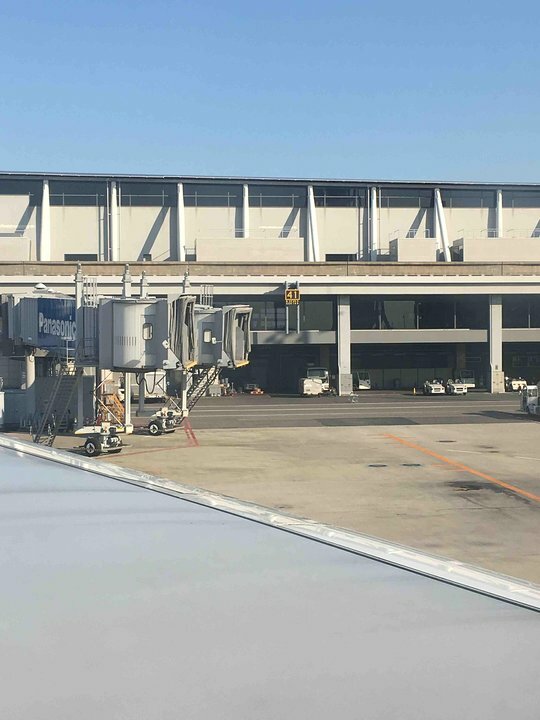 My wife and I sat by the double seats by the window which start in this row. We paid a little more for the privilege of not having anyone beside us but it's a rather boring 5.5 hours of looking at the seat back infront. Engines are ahead of you so rather noisy! Lousiest service provided by Airasia X. I need to pay an extra amount in order to seat with my children. Great seat, i am a fat bloke at 130kg. I could sit comfortably for the flight from KUL to SYD. The ordered meal was ok and the service was very friendly. for LCC, standard seat width and pitch and quite comfortable traveled from CTS to KUL. Comfortable leg space(i am 5ft 7 inch), especially on this long flight, seat width is a bit lesser than full fledged carriers might impact if you are well built. Surprise was there were Power Charges on all the seat that are close to the exits and bulkheads(17 row 16 row, 15 row). Recommended seat option, worth the money spent on the Hot seat. I sat on the window seat and it was the smallest seat I have ever had in a plane and closest to the front seat. So much so I could not straighten my legs at all. Surprised I did not get a dvt. The row of seats at the back are very noisy compared to the ones in front. Also food is always served from the front of the cabin, so be prepared to wait a long time if you are seated at the back. Needless to say, you never get to board first as all the 10-13 AirAsiaX flights I have been on - they never board by row numbers: queues begin to form once the departure gate counter is staffed. And you get off last too which means that there will be hundreds in front of you at Immigration. Extremely noise...Please prepare your ear plug. Seat is AirAsia X standard, however the seat is next to a fuselage frame and will cause discomfort for passengers with broad shoulders. Row 7 has extra leg room, but the an rests are fixed in place due to the fold-out tray tables. just fly with this airplane vv (39H & 23C) for medium haul (KUL to KIX). for LCC, its comfortable enough, there is small height-adjustable head rest. but, with 3-3-3 composition, the aisle is very small, and if you seated on the aisle, you will not sleep tight. for me, the seat on this aircraft is good for the the price that they gave me. i am 14 year old and i'm 173cm tall and i can fit the seat, although I barely fit but it was good. no one is sitting next to me the flight was great. FOR ALL OF YOU DON'T EXPECT MUCH FOR A FLIGHT WHICH IS ABOVE 5 HOURS FOR A PRICE BETWEEN 150 TO 250 DOLLARS. SO, DON'T REQUEST A IFE OR FREE MEALS OR A GIGANTIC SEAT AND AIRASIA X PROVIDE BUSINESS CLASS SO USE BUSINESS CLASS AND STOP COMPLAINING!!!! I wouldn't recommend this aircraft for a long flight - flew from OOL to AKL; even after the 3 hour flight in the loud, tired aircraft, I couldn't wait to get off... Though the crew were polite, there was minimal legroom, minimal seat width, and IFE was non-existent. Do not take this plane for a long flight. I m 1,90 cm tall, the pitch is 31 and its more or less fine, but the seat width is awful. Next to me sat a Russian guy and I had to suffer for 6 hours. This seat configuration is suitable for young girls. The economy seats for air asia flights are absolutely crap especially on long flights . Very squashed in confined space . I flew melb to kl , 9 hour flight . No onboard entertainment system . I will never do a long haul flight with them again regardless of cost ill be paying extra and fly with someone else .Airasias problem is there seating 3x3x3 9 seats across . 2x4x2 8 seats flying everyone else . They have put another seat in hence loosing a bit of space . Love travelling AirAsia X have upgraded to Business class and it is well worth it. The Quiet Zone is great my only complain was this guy two rows away kept me awake with his loud snoring. And I mean really really loud. Not sure that the crew were culturally equipped to deal with this situation. I was ready to old a pillow over his face 4 hours in! Watch out for Hot Seats in row 34 - D, F or G. They are behind a toilet bulkhead and while there is a sign saying this row isn't a thoroughfare, many passengers use it to move from one side of the cabin to the other - stepping over your legs or insisting you move your legs to allow them through. I told people not to pass and some were rude about it, insisting they had right of way. Book 35 B or C, or 35 H or J to avoid this. Don't book 35 A or K as the legroom is taken up by a large box sticking out of the aircraft doors on either side. In my opinion these hot seats at the back of the aircraft are better than the quiet zone at the front - more room, less expensive. Yes you get noise, but not a big deal for me. This seat was comfortable but getting up involved climbing over another passenger. No USB power, noisy cabin (screaming babies), unreliable cabin service. OK if your objective is to save money. It's very comfortable and I love it. Thank you AirAsia X! I have flown economy on this aircraft plenty of times and really have no complaints. I fly mid-week KL to Aus which usually means a lot of empty rows and I have one to myself. It is a budget airline, so bring your smart phone /tablet etc and decent headphones, buy a meal for a few $ and you just saved a packet over the main airlines. This was the third time I have travelled KUL to MEL on this flight. I am tall and usually purchase a hot seat with extra leg room. I chose this seat in the quiet zone this trip, (all the extra leg room seats were already booked out). The quiet zone was appreciated, however all economy seats are incredibly narrow. Leg room is minimal. Unfortunately the flight was full due to Chinese New Year which made travelling even more difficult. 7A,B,C,H,K,J are specified extra leg room but it is not that comfortable. There is a bulk head right in front of you and you can not stretch your legs out. Even my daughter who is 5'4" had to bend her legs, very uncomfortable. The seats are way to narrow, I am thin and I struggled. No IFE, tiny seats, very disappointing. Unbearable discomfort for such a long flight. Seats too close to each other with insufficient leg room. I doubt I would travel again on this airline. No complaints on the service, just the seating discomfort. The seat here is just like any other seat. Unlike other carriers, this one can recline just like all the others, which came at a surprise to me. One not so good thing about it is the fact that this seat is at the rearmost end of the plane. The engine is rather noisy back here, which makes sleeping a bit difficult if one is not very tired. Seats are far too small for the average human. Lucky I was travelling with my partner and was able to encroach on her personal space for the whole 6 hours of our flight. Pay the extra and get a "hot seat" for your own sanity! XT is the code for Indonesia Air Asia Extra which operates a direct MEL-DPS flight. These are essentially the same seats as found on Malaysia Airlines B777 business class with a few less features like lumbar adjustment and massage function. It is very comfortable in all but fully flat mode. Service was excellent both ways, with the crew showing a flair that is hard to find nowadays. Food is not great but I don't care much for plane food, its the hard product and service proposition that I look for. A very unique product for a LCC and highly recommended especially if you can score a sale fare. We paid extra for these seats, and yes, the seats H&J do have lots of extra legroom. K has too, but only if you slant your legs as the door mechanism is directly in front of you. However, the loss of the front pocket and the fold down table, and no place to slide your laptop bag, etc., almost negates the leg room. Plus, I'm only 5ft 9in and not fat, ditto the man sitting next to me on 15H, but boy, was it uncomfortable for him and me! Unless you're 6ft 6in plus, pay the same amount and get the Quiet Zone. It's quieter, was much less full (so we could stretch out on that flight) and all together a better deal! Good Seat, the quite zone seats can be buy at seat selection in. The different between quite zone area is only in this area not allowed for passanger under age of 12 y.o. So i recommend this seat. At 180 centimeters and 86 kilos I fit just fine into a normal seat, but 9 across in a 330 is too cramped for my taste. You just can't get away from the person next to you (good thing it was my wife) and legroom is quite limited as well. Very good seat. The quiet cabin is bookable for a small fee, which is about 10. I would highly recommend booking into this cabin. On the flight from ICN to KUL the main economy cabin was packed, while the quiet zone was pretty empty. The legroom is good, the lights go off pretty quickly and you can get some sleep. 14G is actually a good seat, it's on the opposite side to the lavatory, curtain is drawn so galley is not bothersome, and you can recline without disturbing anyone behind. We took these seats on four 6+ hour flights between Seoul and Kuala Lumpur and between Kuala Lumpur and Melbourne. The idea was that it would be good for us as a couple to avoid having people beside us. The trouble was that it is VERY NOISY back there and the pilots spent much of their time, even in cruise, gunning the engines continuously. So it would go from just bearable to really loud and back, for hours on end. No relaxation to be had! I'm sure my hearing was affected! Make sure you take very effective ear plugs if you take these rear seats. AirAsia X flies 1 versions of Airbus A330-300.